Yesterday we had a visit from the engineer to sort out our engine. We had discovered when we went to fill up with diesel that the water pump was leaking. We had been waiting for the engineer to come and fix this, but Monday Keith took the pump off and Roger stripped it down to discover a worn nylon seal. Roger turned 2 new ones out of PTFE so that we have a spare. 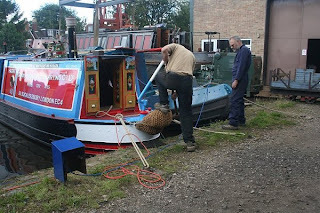 Keith and Roger refitted the pump and tried running the engine to test it to then find that the governor was jammed solid, hence the visit from Paul Redshaw yesterday. Upon opening up the engine casing we soon discovered a further problem, emulsified oil. Then having taken the governor casing off and stripped it down it would seem that water had got to the spindle and jammed it. The route cause of this, a suspected head gasket leak, which would also tie into the water and oil we had noticed bubbling from around the head when we went for diesel. The spindle was cleaned up and refitted, moving quite freely now, and the governor assembly was refitted to the engine. Then we had to drain all the oil out and fill it up with new, before running the engine again. No leaks from the water pump and the governor was once again working properly. The bad news is that we have to have a new head gasket made, they are not available off the shelf, and it will take 4-6 weeks to get one made. So we will be spending a few more weeks here in Stone. Keith has asked for 2 gaskets to be made so that we have a spare for the future. Tina has been busy working out the lettering for our sheeting, have drawn it all out a couple of times and put it onto sheets of grease proof paper, she then laid it out on the sheeting to make sure it was the correct size lettering and the curve on the letting was correct. Having got an agreement from us and Roger that it looks right, she can now make cardboard templates ready for a good day to do the lettering, we need a dry calm day for this job. 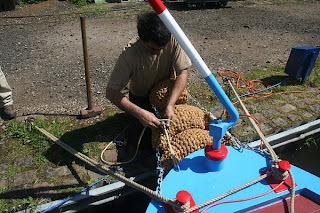 The timber has arrived for the flooring in the hold, so that is a job Roger will be getting on with, as well as finishing off the final touches to the boat, which we wrote down for him. The funny thing has been that no sooner he has crossed a couple of things off the to do list we add a couple more things. Still the list is now down to 4 things and then that is that she is done yayyyyyyyyy. We now look forward to a lovely Bank Holiday weekend, so no matter where you are, or what you are doing have a lovely time. This is just a quick message to say hello and wish you a wonderful weekend. 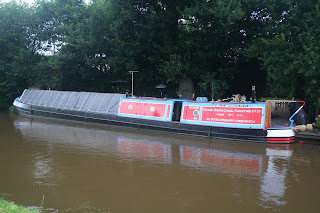 Roger is now back from his holiday on his boat's Azalea and butty Ilford, you may have spotted them if you were on the Llangollen. 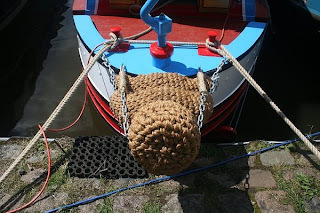 They were spotted by Sarah on NB Arcadia, who is hoping to be in Stone in the next week or two, and we are looking forward to saying hello to a fellow blogger. 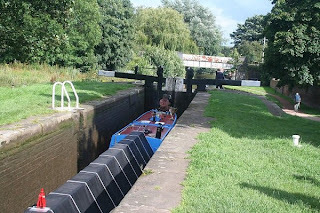 Hadar has been receiving some wonderful comments whilst she has been out on the towpath. With people stopping to ask about her and her engine. I would like to to say "Hello" to those on NB Hannah, who came past us and said they had been following "Hadar" on this diary. Maybe next time we will get to have a proper natter. 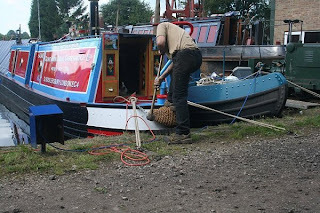 Hello to the folks from working boat Denebola, which is also a Grand Union boat. They were walking along the towpath and had a nice chat with Keith. We have been asked if "Hadar" is an original working boat been done up, and as you all know she is brand new, but in a way she is an original. 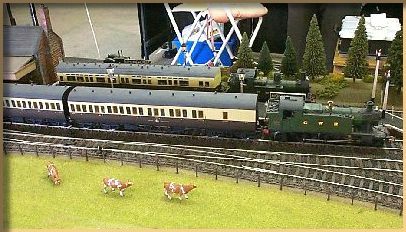 She is a Roger Fuller original, and there will never be another one like her, even if Roger does build another Small Northwich for another customer. Because all of Rogers boats are Bespoke you will never ever see two the same. Well it is the weekend and we hope that where ever you are, you are having a wonderful time. Hopefully next week things will progress on "Hadar" and I can add some photos to let you see the work being carried out. Take care and stay safe. Heading into the weekend and who should we see coming towards the basin above Lime Kiln Lock, but Andy and his dog Simba on Khayamanzi. He was a welcome sight as we had not seen him for almost a year, whilst on our travels. 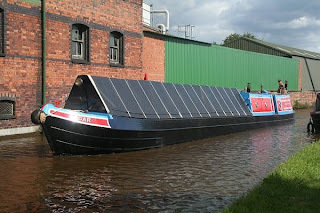 Andy was well and heading for the Anderton lift and the river Weaver. So after a quick natter with him on the move we said our goodbyes and hoped to see him again soon. Andy had a wonderful floral display on his roof top, an absolute credit to him. With the weekend uopn us we took "Hadar" out of the basin and onto out boat painters mooring whilst they took their boat out for the weekend, it gave us the opportunity to clear out the hold of all the stored goodies we had in their. We had decided if there was no room for it in a cupboard, draw or under the floor, then it was going either in the skip or in the boat sale boxes. It was actually amazing because we managed to store a lot of the stuff on the boat. Although I did fill two boxes with things to sell. Roger is on holiday with his family so there was no problems with us getting things sorted out on the boat, it was a wonderful chance to get ourselves organised, if you ever really do that LOL. 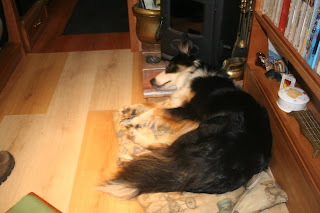 Paddy has well and truly made himself at home on the boat, and likes to curl up by the saloon stive with his head on the harth. Whilst taking this photograph Paddy was having doggy dreams, his paws were twitching and he was making gruff noises, he looks so sweet and peaceful. 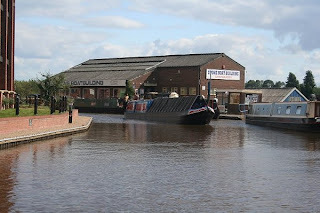 The weekend over, we moved onto the towpath mooring and moored up infront of us was a boat named Beau, it's owner was a lovely gentleman called Trevor. (Hi Trevor if your looking in). Trevor took a real liking to Paddy and jokingly asked if he could have him, to with my reply was "No" LOL. Anyway after chatting about life, boat, life and more boating, he has asked for the Border Collie Trusts phone number, which I got for him, so he can find himself a suitable dog for the boat. I really hope he finds a lovely collie and that we get to see him again soon. 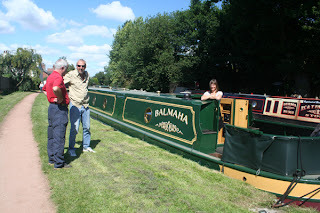 Today (Wednesday) and we had a lovely visit from some blogging friends on their narrowboat Balmaha. Their blog is well worth a read, it can be very entertaining. Mo and Vanessa came to see "Hadar", and of course us lol, it was actually wonderful to put names to faces, and you know I felt like I had known them for many years, and yet today was the first time we had met in person. They spent must have been a good 3 hours with us, how the time flew as we nattered about all things boaty. 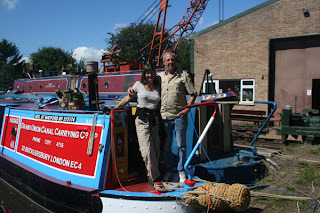 It was wonderful to finally meet them and to find out how things were for them on the cut. 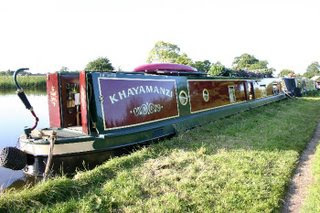 Keith and I then walked on round to Mo and Vanessa's boat, and a beautiful boat it is too. 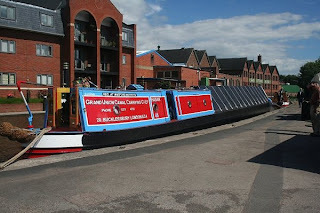 The photographs do not do their boat justice. It is a credit to them and the builder who built for them. 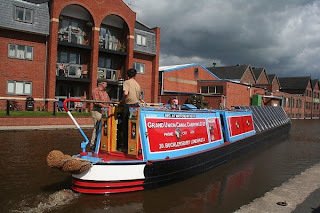 They are now on their way, and will be making their way possibly onto the Caldon so if you see them give them a cheerie wave and say hello. Mo and Vanessa we hope to see you on the return trip... So as you can see although nothing much is happening on "Hadar" we have been kept busy. Awaiting the 800litres of Diesel. 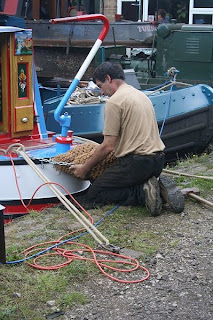 Yesterday following the fitting of the fenders we took Hadar down to Stone Boat Building to fill up with diesel. This was her 2nd trip out, but the 1st doesn't count as we only winded her so we could fit the stern fenders. It takes quite a while to load in 800litres of diesel, and a lot of money! The Builder Tries Her Out. Whilst we were filling her up with fuel Roger appeared and we invited him to have a play with her. Having winded her I took over the controls and brought her back. As can be seen from these photos she moves gracefully through the water, hardly creating a ripple. Still in one piece and not sunk. 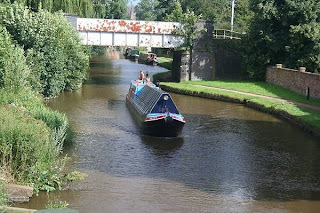 Coming Up through Lime Kiln Lock. Today saw the fitting of the rear fenders. The 1st tipcat had to be hammered into shape with a sledge hammer, and readjusted each time until it fitted the shape of the boat. The 2nd tipcat was similarly hammered into shape around the 1st one. After each hammering the chains were readjusted to take up the slack before hammering again. This was repeated until the final shape was achieved. When the 2 tipcats were fitted the button was added behind them.